Assyrians celebrate Easter at the Assyrian Evangelical Church of Tehran. 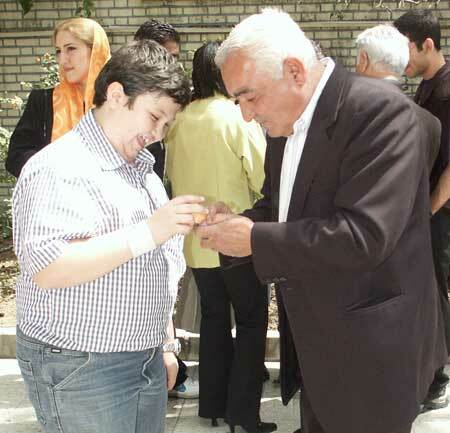 Pictured above is an Assyrian youth and Rabbie Babajan Tamrazi enjoying the challenge of "egg-breaking" - a traditional Assyrian game played during the Easter festivities. Rabbie Babajan is considered by many as the most important figure today in the promotion of the Assyrian sports in Iran. Ramsen Sheeno Releases New Video, "Khoolma Sodana"
Last year we had a date with destiny, an unexpected rendezvous with our future. It was the culmination of a roller-coaster ride which began 14 years ago in Baghdad and Berlin. 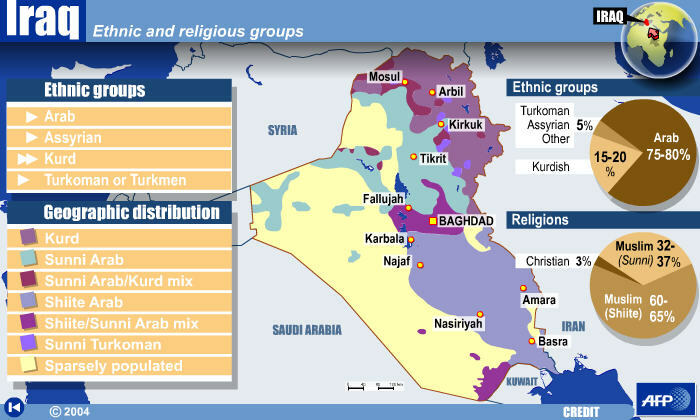 With the end of the Cold War, and after two Gulf Wars, every ethnic group in Iraq found itself face-to-face with the possibility of playing an active role in the future of Iraq and the Middle East, to attain its political and cultural rights, and if necessary demand territorial integrity for its own homeland. None of this was conceivable even a year earlier. Some had already attained a strong leadership with a vision of future and effective infrastructure to help achieve their people's national objectives. The Assyrians possess neither. The good news is that we have the right ingredients and sufficient time -albeit very little- to accomplish what our Kurdish neighbors did between 11 September 2001 and March 2003. In March 1990, Germans voted for the unification of the two Germanys. The Cold War was officially dead. Five months later Saddam Hussein invaded Kuwait. In January 1991 the U.S. Congress authorized President Bush Sr. to use armed forces to liberate Kuwait. The U.S. was concerned with Saddam’s next possible target: Saudi Arabia - not the creation of a Kurdish state or increasing Shiia power in the region. Rightly so, Assyrians were concerned about the welfare of over two million Christians affected by the internal tensions within Iraq. Fortunately of us, the Assyrian Democratic Movement's leadership also sensed the coming of a great opportunity for the recognition of our struggle in that country. The first Gulf War successfully deterred Saddam, and Kuwait was liberated. Yet without global leadership and the support of our people in the diaspora, we followed the national agendas of other anti-Saddam groups. None of us knew how to handle the situation in 1992. The Muslim groups did not have a "national agenda" of their own either. They fought among themselves, attacked each others' villages and shifted loyalties between Turkey, Syria, and Iran. Yet unlike our Kurdish and Shiia counterparts, we strongly agitated our diminished resources and strengthened a single political entity - namely Zowaa within Iraq -only to help sensitize the rest of us outside the Middle East. Our strategy was to provoke a sharp response and feeling of sympathy for the survivors of Saddam’s brutalities. The Assyrian Democratic Movement became the symbol of our struggle in Iraq and slowly we defined Bet-Nahrain (Mesopotamia) as the country of Iraq, whereas before it had always encompassed Turkey, Syria, and Iran. We reduced our 100-year vision of Nishra d’Tkhumee to a little area within North Iraq. Assyrians made the right decision to support the United States, as they supported the Arabs upon their invasion of Mesopotamia against the Persians. The United States has no co-equal and Iraq must become free. A free Iraq with democratic institutions and a strong market economy provides greater opportunity to obtain our political and cultural rights in the Middle East. Economic sanctions imposed against Iraq worsened the economic conditions of our people. But we stood behind the U.S. and the U.N. resolutions. Where we succeeded in assuring our commitment to the future of a free Iraq, we failed in the process of nation-building on a global scale. We are nearly a decade behind our Kurdish counterparts in forming an international consensus among our political, religious, and social resources to formulate a unified front. Yet we have an incredible opportunity – due to the current volatile circumstances in Iraq – to reach similar state of affairs within the next few months. No single political party can be the voice of the entire Assyrian nation with all its colorful religious, cultural, and linguistic distinctions. Consequently reaching a united political front must now follow the religious reconciliation achieved last year through the adoption of a new name, not identity, for the Assyrians of Iraq, namely the term Chaldo-Assyrians. We must now transition from separate political entities working in silos to a unified front operating as people’s representative within a parliamentary-like framework. We have several proposed models previously discussed in the pages of this publication which must now be seriously considered. Supporting one group in Iraq for example and another in Sweden will only deteriorate our chances of claiming our political and cultural rights in Iraq. The Assyrian Universal Alliance and the Assyrian Democratic Movement have already begun national negotiations, starting with their recent meetings in Baghdad and North Iraq. The Assyrian Democratic Organization and ADM were equal partners in furthering the rights of the Assyrian people in Iraq and Syria even before the collapse of Saddam’s regime. Yet we must move beyond these photo opportunity sessions and engage all significant Assyrian political and non-political entities to a series of summit meetings around the world within the next few weeks and months. Purpose: to establish an effective international infrastructure to support our leadership in Iraq and to create an international political body with regional representation in various countries and/or regions. The Assyrian Universal Alliance followed this formula in 1967 and achieved incredible international recognition until the collapse of the monarchy in Iran and the coming of Baathist power in Iraq. Sadly, during these 12 momentous years (1967-1979) the AUA failed to succeed in transforming the Assyrian nation from groups of disparate communities to a unified global society. In the last 12 years (1992-2004) the Assyrian Democratic Movement has not accomplished greater triumphs outside of Iraq either. Creation of a dozen fundraising branches around the world does not qualify for an Assyrian world representative body. We now have less than 12 months to accomplish what our two major political parties failed in two 12-year periods, before the final stage of the transfer of power in Iraq is put in motion - as noted in President Bush's speech earlier this week. April is a special month in the political life of the Assyrian nation. On the 10th Assyrian nationalists celebrated the anniversary of the first AUA congress which took place in the city of Pau in France. Two days later the silver anniversary of the establishment of the most successful political party in the homeland– the Assyrian Democratic Movement – was celebrated throughout the world. Neesan 2004 must now signify the beginning of new plans for the revitalization of old dreams. Zinda Magazine’s proposed Operation Tammuz is a small step in the right direction. It is meant to prepare us for the compromise solutions that senior Assyrian officials will outline in private. The response from our readers in the last few weeks has been tremendous. The project will be officially debuted later this month to identify vital resources and initiate grassroots movements. But Operation Tammuz is not enough to create a national agenda, an effective international infrastructure and leadership. The balance of power has once again shifted in the Middle East. With Saddam gone, a power vacuum is created and the governments in Ankara and Tehran are now compelled to recalculate their military and nuclear power requirements. While President Bush is finding it more difficult these days in persuading the American public to continue support for a U.S.-led military presence in Iraq, the economic conditions of Afghanistan and Iraq are not improving. Iran and Turkey are becoming more suspicious of the U.S. intentions in granting special status to the Iraqi-Kurds through the newly-signed Interim Constitution. What does all this mean for the supposedly powerless Assyrians in Iraq and around the world? Zinda Magazine calls upon all major political parties to declare their willingness - by 16 May 2004 - to work together in reaching the unreachable star - to form a global infrastructure within which an effective political leadership can be established before January 2005. On 17 May the list of these political and non-political entities (Federations, Churches, Media representatives, etc) who took the initiative to cooperate in 2004 will be released to the Assyrian public. In the same issue, Zinda Magazine will outline the mutually agreed plans for the historical gathering of these groups and institutions. Last year, for the first time in a very long time, we met face to face with our destiny. We discovered that we are not as powerless as we once thought we were. We also learned that the past no longer equals the future. Once again we can dream of a new Assyria with one name, one purpose, one leadership for one nation. What was only a dream conceived in Pau, France in 1968 is a possibility today because of a series of international events, including the end of the Cold War and the liberation of Iraq. Where we go from here is no longer in the hands of a few, rather up to all of us. We have only one option: to move forward - together and united. Click the map above to view the animated presentation courtesy of Agence France Presse. “The passion of the Christ”, a controversial movie directed by Mel Gibson, shed light upon Aramaic Language, the language of Jesus Christ. All the dialogues in the movie between the Christ and his Apostles, between him and the Jews were in Aramaic and these dialogues absorb more than half of the movie. Many viewers and journalists who watched or reviewed the movie believe that the Aramaic language, the language that was spoken by the Christ and the people of the region two thousand years ago, is now one of the dead or vanished languages. This conception is not right at all. The Aramaic language, including its both branches, Western and Eastern, is alive and well: around three million people are still using it in their daily lives. Western Aramaic is the language that Jesus Christ, his disciples and contemporaries spoke and used in writing. One dialect of this language is spoken even now in Syria, in the villages of Malula, Bakhaa and Jubabdin, Northeast of Damascus. In spite of the fact that most of the population of these villages converted from Christianity to Islam in the last 200-300 years they did not abandon their ancestral. Aramaic dialect of these villages is the closest vivid cousin to Galilee Dialect in which Christ spoke. Eastern Aramaic is the language of the followers of Chaldean, Assyrian and Syrian-Orthodox and Catholic- churches in Iraq, forming one stock, from Babylonian –Assyrian origin. The Eastern Aramaic that we now call “Syriac” considered one of the most preeminent Aramaic dialects that has been spoken, developed and survived because it was related to the spread of Christianity in the area, and became the official and popular language of Mesopotamia and Persia for many centuries before and after Christianity. But the Aramaic retreated step by step with growth of Arabic, starting from the seventh century after, taking over the Arab-Muslim population in Iraq and the immigration of big Arabic tribes to the newly occupied lands. In spite of that, the Aramaic “Syriac” was still popular, elaborate on use in church and government, until the thirteenth century when the Mongolians occupied Iraq, killed and expelled big quantity of Christian, the speakers of Aramaic. For 2800 years, thousands of epics, stories, historical, Science and religious books, including the Gospel of Matthew were written In this expressive language. The Assyrian, Chaldean and Syrian writers and translators have translated in the ninth and tenth centuries hundreds of Scientific, historical and literature books from Greek into Arabic through The Aramaic “Syriac” Language. Aramaic “Syriac” has been used for two thousand years until now in prayers and religious ceremonies of Iraqi Christians (Assyrian, Chaldean and Syrian) and until the middle of the twentieth century has been used in Maronite Churches in Lebanon. Today, there are about three million people in Iraq and Diaspora speaking in Aramaic “Syriac”. The Aramaic or Syriac is their mother tongue. They are using it in their daily lives inside their villages and towns which are scattered in the north of Iraq and in their communities in Baghdad, Mosul (Nineveh) and other Iraqi cities. Also it is used in many other Diasporas, especially Chicago, Detroit, San Diego and Toronto. But more than half of Chaldean, Assyrian, Syrian nowadays cannot read and write in their mother tongue because they were not allowed to learn it in school. The Iraqi regime of Saddam Hussein also impeded its instruction when they tried to learn it in churches, private schools and courses. In the northern Iraq, exactly as, in the UN Protected Zone students started 10 years ago to learn Aramaic “Syriac” in some of the schools where they have a majority of Chaldean and Assyrian. There are now some 5-6 thousand students learning their native language. After the collapse of the regime of Saddam Hussein, the Iraqi Governing Council permitted Assyrian, Chaldean and Syrian to learn Aramaic language “Syriac » in the government and private schools, and a special clause about that was added to the new temporary constitution which was approved recently. There is a weekly newspaper and many monthly newspapers and magazines publishing now in Iraq in Syriac, and many radio stations and one TV station broadcasting for several hours a day. Approximately half of the Aramaic “Syriac” speakers population is living (in the last three decades) in Diasporas, especially in USA, Canada, Australia, Sweden and other European countries. In these countries they have clubs, societies, schools, churches, newspapers, radio and TV stations, Musical troupes, and Internet sites. And, usually, they use Aramaic “Syriac” language in their activities. In Canada we have around thirty thousand Assyrian, Chaldean and Syrian with many cultural and social associations and clubs, more than ten churches, holding their ceremonies and Masses in Aramaic. We are pleased to report that Bet-Nahrain National Quest convened a congress in March, 2004, in Chicago, Illinois, U.S.A.
During this meeting, our members discussed the proposed agenda freely and in the spirit of democracy. Several resolutions were adopted to address the political reality in Iraq. The Chaldo-Assyrian people struggled side by side with all Iraqi patriotic forces against the now-deposed dictatorial regime. Much was sacrificed in the cause of national liberation, for the regime of Saddam Hussein used torture, suppression and military action to stop the march of the Iraqi people toward freedom, prosperity and a democratic system of government in a new Iraq. Although the old regime is gone, we realize that the road ahead is long and difficult. But we are hopeful for the future. Uphold the territorial integrity of Iraq. Support a multi-party system and a peaceful transfer of political authority so the Iraqi people can establish civic institutions and create a new and lasting constitution that gives Iraqi citizens basic rights and freedoms. Such a constitution would be the foundation on which a society based on the rule of law can stand. Individual freedom must be beyond compromise. Support the declarations and resolutions of the Chaldo-Assyrian congress of Baghdad held in November of 2003. Adopt our unified name, because Chaldeans and Assyrians are one people. Chaldo-Assyrians, the original inhabitants of Mesopotamia, are an integral and inseparable part of the Iraqi people. Support the Iraqi Governing Council and honor its efforts in creating a new Iraq. Honor the new interim constitution. This vital document represents the national will of the Iraqi people and embodies their hopes for freedom, human rights and democracy at this moment in their country’s history. The interim constitution will serve Iraq well until a permanent constitution can bring deeper peace and greater stability to all of Iraq’s people. Rebuild our villages so that their original inhabitants can return to their homes. Form self-administration units where Chaldo-Assyrians live in accordance with 1954 statistics. Establish the Chaldo-Assyrian name in the future constitution as one of the primary and historic peoples of Iraqi society. Establish our cultural rights and our Syriac language in the future constitution. Teach Syriac where our people are in the majority. Create a department of high studies in the Syriac language and literature. Representation in the national assembly, according to our numbers. We believe that the formation of a state based on the rule of law and democracy, a state whose citizens are respected, will improve Iraq’s relations with the world and bring stability to the region. We believe that all conflicts must be resolved by peaceful means. We believe that the people of Iraq must strive for political and economic cooperation. We believe that Iraq must respect international law and the United Nations charter. We reject extremism and violence and stand against international terrorism. Long live the Iraqi people. Long live the Chaldo-Assyrian people. Long live freedom, the rule of law and democracy in the new Iraq. (ZNDA: Sterling Heights) The body of an Iraq native killed in his homeland was returned Tuesday to Michigan, his widow says. Emad Mikha, 44, died while working with the U.S. Army as a civilian translator. He left his family in Sterling Heights and his job as a supermarket butcher last year to assist U.S. troops with prisoner interrogations. Rita Mikha said she learned April 4 -- their 16th wedding anniversary -- that her husband died in the town of Muqdadiyah, about 70 miles northeast of Baghdad. She said Tuesday that she still had no information about how he died and was told autopsy results would not be available for four to six weeks. Visitation was scheduled for 5-8 p.m. Wednesday at the Hopcroft Funeral Home in Madison Heights. A funeral Mass was to be held at 10 a.m. Thursday at Mother of God Chaldean Catholic Church, followed by a military service at Holy Sepulchre Catholic Cemetery, both in Southfield. Rita Mikha said relatives, neighbors and friends were offering comfort to her and her three children, but having no income and no insurance left her anxious about the future. "It's very hard for me to deal with this situation," she said. "I already lost my husband." A memorial fund for the children of Emad Mikha has been established at TCF Bank, 8202 Metropolitan Parkway, Sterling Heights MI 48312. (ZNDA: Sydney) Founder of the Froggy group of businesses, Karl "Khalid" Suleman, will spend a year behind bars after being convicted of fraud this week in Sydney, Australia. The New South Wales District Court Judge Peter Berman sentenced the Assyrian businessman to 21 months in jail for fraud. The 43-year-old was given a 12-month non-parole period, making him eligible for release on March 4, 2005 - one year after being convicted on four counts of fraud. The charges stemmed from an Australian Securities and Investments Commission investigation into Karl Suleman Enterprises and businesses in the Froggy group. The Crown said Suleman had lied to finance brokers, exaggerating his wealth to obtain loans of almost $3 million for two Ferrari cars and a luxury yacht. Mr Berman said Iraqi-born Suleman needed to be personally deterred because he showed no sign of remorse despite the "overwhelming Crown case". "It's not as though his offence was an isolated one which he immediately regretted," Mr Berman told the court. "He told four separate lies in relation to these four separate counts, the first in December 2000 and the last in October 2001. "The fact that even now he continues to deny any wrongdoing suggests not only that there is no remorse but also that I cannot say that his prospects of rehabilitation are good." He said although a custodial sentence was required, Suleman's actions did not cause a substantial loss, he had no significant criminal history and he was, "at least until first offence was committed, a person of good character". "The offender seems to have been a hard working and productive member of society," he said. "It was when he set up the Froggy group of companies that things went dramatically downhill." Outside court, 61-year-old Yacoub Kako, a disgruntled shareholder who lost $125,000, said the sentencing was nowhere near appropriate. "The decision is not enough. He should get all his life (in jail)," Mr Kako said. Suleman had denied the charges. The jury in his trial was told in December 2000 he provided one broker with a forged bank statement, claiming to have $14 million in a joint account with his wife, to secure finance for a $355,000 Ferrari Spider convertible. In March 2001, needing a $2.3 million loan for a $3.3 million Princess motor yacht, Suleman falsely told a broker he had $18 million in the bank. With his eye on another Ferrari, Suleman applied for a $250,000 loan in October 2001, again telling a broker he had $18 million in the bank. 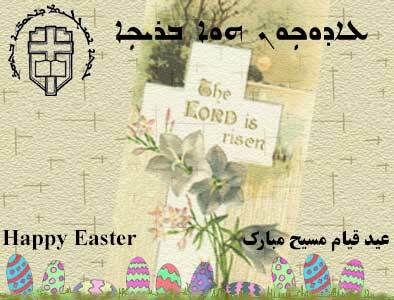 Wishing you, all your readers, and all my Assyrian brothers and sisters a Happy Easter. May our lord and saviour Jesus Christ shine his blessings on all of us. May Alahta Ishtar's festival bring fruitfulness to our beloved nation in it's unity and multiplicity. In response to Paul Younan's letter of last week concerning the revelation of our true holidays I want to clarify the use of Easter in Acts 12:4. In order to understand why Easter is the correct word and not Pascha (Passover), as was claimed by Mr. Younan, it is important to read verse 3 of that chapter which clearly states that Peter was taken during, "the days of unleavened bread." The next verse then speaks of "Easter" in the King James Version. Now if the word is translated as "Passover," we have a problem because the Days of Unleavened Bread come before the Passover. In the Biblical use of the term, Passover came before the Days of Unleavened Bread (Exodus 12:1-8, 15, 19; 13:7; Leviticus 2:11; and Deuteronomy 16:4). We have a problem with these verses if Passover follows the Days of Unleavened Bread. However, the problem is solved when we see that "pascha" means more than "Passover" as has been shown above. Peter was held under Roman guard by a king who was appointed by Roman law and influenced by Roman customs that had been taken from the Babylonians. Contextually, it would seem that this "pascha" which followed the Days of Unleavened Bread was not the "pascha" (Passover) which preceded the capture of Peter. Instead, it can only refer to the Roman celebration of Ishtar's resurrection, hence called "Easter." For years I have maintained during my discussions or debates with friends, or anyone, that Greeks did us lots of harm---the ungrateful Greeks. Ungrateful, because they benefited from us in different ways and at different levels. I don't have to go through them, for you know them better than I do. They owe their greatness, in part, to Assyrians. It wasn't only 'calling us Syrians' and 'calling our language Syriac' that they did, but throughout they never hesitated to undermine our identity and to 'marginalize' our entity; they did this in order to establish their own 'superiority'. They were jealous of us. This was mainly a linguistic jealousy, because our Lord and Saviour spoke in our rich and spiritual language. They also envied us. This was a cultural envy; indeed, culturally, in every way, we were ahead of them. (Do you know that Titian ' The Mighty Assyrian Intellect' taught two of their well-known philosophers, both philosophy and theology?) Yet today they, the Greeks, are ' The Monopolizers' of the New Testament, and Greece ' is the birth-place' of the Western civilization. And look at us---the state that we,"the Builder of the Cradle of Civilization", are in. The World together with its United Nations still does not want to believe that we are Assyrians, the people who have continually contributed to the Civilization and Christianity of the World---Sad! Sad indeed. About a week ago I came across, on the Internet, the website of Victor Alexander, an Aramaic scholar and the translator of the New Testament from Peshitta-Aramaic into English (he is now translating the Old Testament). In his articles, among other things, he is talking about some of the things that Greeks have insidiously and artfully done to damage/harm/destroy the Assyrians' prestige/reputation/greatness----what I have always believed to be the case. He says: " .....However, the Greek and the Roman converts had another agenda. They wanted to dispossess the Jews and in fact all Aramaic speaking peoples [mainly Assyrians of course] from their faith in the Lord, because of racial prejudice. There- fore by claiming that the New Testament was originated in Greek, the Western Churches could now go on to claim that God took the Kingdom from the Jews and gave it to the 'Gentiles' to represent themselves as the people of the New Covenant. The word 'Gentiles' is a total fabrication. There is no such word in Scriptures. As for the Aramaic-speaking followers of Jesus Christ, their name was eliminated from the Scriptures. They were Easterners and the Greeks were classified as Europeans." Then Victor Alexander in another article talks of 'Nestorianism' and the ridiculous label, 'Nestorian', imposed upon the Church of The East. (I don't have the particular article now to quote from it.) This was something that I did not know about. I was disgustedly astonished! According to Victor Alexander, Greeks also played an important part in the whole 'dirty affairs of Nestorianism' (my words not Alexander's). We, Assyrians, think (and mostly believe) that it was the Western Churches and among individuals people like the 'pompous and arrogant Cyril', the Patriarch of Alexandria, who were responsible for labeling our Holy Church "Nestorian"---but not quite so. Greeks played a significant role in the whole affair; and the Western Churches/World 'gladly' followed into their footsteps, as they have done so always. The conclusion that I have arrived at is that for the state we are in today not only in part, but "probably largely" the Greeks are Responsible. And let every Ashura know this---this 'bitter truth'. However, we Ashurayeh must not let this 'bitter truth' make us feel bitter against the Greeks today. But we must try to learn a 'Good Lesson' from it. Just yesterday my family and I were arguing about whether there are any Assyrians living in the city of Falouja which has been the hot bed of resistance to American presence in Iraq. And just this morning, my friend from Baghdad called me here at home as he always does. He is a member of Zowaa in Baghdad. I asked him many questions and one of them was "is there any Assyrians in Falouja" and his response was "yes there is, in fact just two days ago, we were there"
I was like "what, what were you doing in Falouja in these dangerous times?" and he said "we were there to give food and medical assistance to Assyrians in that city who were affected by the recent American blockade of the city"
Zowaa sent in a special team with humanitarian supplies to the city for the needy Assyrians there. This letter is to reply to Ms. Shamiram Nader who was concerned about our dearest Assyrian singer Ms. Linda George not being on the May 2nd party. We had contacted Linda and all other Assyrian singers. Ms. George told us that she will not be available for this date. She is going to be on a Europe tour. Thanks for being concerned. Ashur TV staff is always ready to serve our nation and open for critics. We cordially invite you to the 5th REUNION of the “Assyrian School Kirkuk” dinner and dance party being hosted by The California Chapter for all students, their parents, friends and relatives. 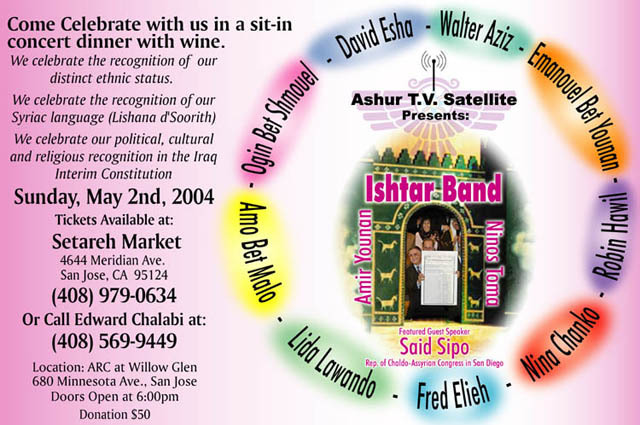 This party will take place at the Assyrian American Civic Club in Turlock on Friday, July 2nd, 2004 at 06:30 pm. Dinner will be served at 8:00 pm. During the evening, Awards of Gratitude will be presented in honor of some Assyrians in appreciation of their dedicated services towards the Assyrian School in Kirkuk. This event will allow you to meet and reunite with old friends from US, Canada and other parts of the world. Displayed throughout the event will be many memories captured from days past, i.e. since early 1930s. Please complete the attached pro-forma and return in the enclosed self-addressed envelope together with your check payable to Assyrian School of Kirkuk by May 30, 2004. Please note that so far more than $13,000 (thirteen thousand), being the proceeds from previous Reunions that took place (2 in Chicago, USA) (1 in Toronto, Canada) and (1 in Sydney, Australia) have been sent to our needy Assyrians back at home. All funds earned from this Reunion will again be sent to our needy brothers and sisters and to the Assyrian School Building Fund in Kirkuk. Evening: Free, visit friends, clubs, etc. Morning: Attend Mass at the St. George parish in Ceres, followed by breakfast in honor of the visiting guests. The James Lecture on Assyrian Civilization and Culture was established in 1999 by the late Helen James Schwarten, a prominent and active member of the Assyrian community. The Lectureship was conceived with the purpose of promoting understanding and scholarship of both ancient and modern Assyrian culture. Mrs. Schwarten’s gift to Northwestern University was just one of the ways in which she expressed her commitment to the Assyrian community. She sponsored educational and cultural events for adults, endowed hundreds of college scholarships for young people, formed a library and museum, and helped countless immigrants make new lives for themselves in America. As a young girl, Mrs. Schwarten fled Persia with her family and after three years arrived in the United States. A devout Presbyterian, she met her first husband, Jeremiah (Jerry) Sargis James at church. They raised two sons, Edward and Kenneth, who have followed in their parents’ footsteps of philanthropy and devotion to the Assyrian community. Northwestern University is honored to perpetuate the educational tradition of the late Jeremiah S. James and Helen James Schwarten with this Inaugural Lecture. Lecturer Professor Abdul Massih Saadi teaches Arabic and Syriac languages and their literatures as well as a variety of courses on Eastern Christianity and Islam. In addition to ongoing research on the history of Christianity in the Middle East – particularly of the Syriac churches – and catalogue of Syriac and Arabic early and medieval manuscripts, Professor Saadi has edited and translated the encyclopedic work of Moshe Bar Kepha, a 9th century Syrian bishop and Scholar. A Research Associate at the Oriental Institute of the University of Chicago, he has taught at North Park University’s Center for Middle Eastern Studies and the Lutheran School of Theology. He currently teaches at the University of Notre Dame. For more information call 847/467-3005. August 5 through August 7, 2004. The Interparliamentary Conference on Human Rights and Religious Freedom is composed of members of national and supranational parliaments from around the globe. While regional bodies bring together parliamentarians from member countries to discuss religious freedom and human rights questions, there are no similar bodies on the global level. The unique nature of the Interparliamentary Conference on Human Rights and Religious Freedom allows members of national and supranational parliaments to meet and address the issues of human rights and freedom of religion with common understanding and background as legislators. We are very pleased to report to you ACLC Online's official launch! As we move forward with lobbying the Government of Canada, we will continue working to ensure that Assyrian-Canadian voices are heard and that Assyrian-Canadians are included in every decision the Canadian Government makes. We would like to thank each and every one of you for your hard work, dedication, and interest in spreading education and awareness for the Assyrian cause in Canada and worldwide. Please do not hesitate to contact us if you have any questions, concerns, or suggestions at info@aclconline.org . The Assyrian Evangelical Presbyterian Church in Tehran, Iran has debuted its official website (click here). The content of this website include the past issues of the Alap-u Tav magazine, church activities, and a complete list of the books published by the said church in Tehran. Perpetual terrorist acts in Iraq give cause for an unfavorable prognosis. Iraq is rolling into a civil war. We have given publicity to this subject in our “Qala Atouraya” radio programs produced in Moscow, more than once. In the March 13th program we presumed once again that the present situation will voluntarily or not result in civil strife. It is not inconceivable that the United States considers this variant to be a reason for long-term presence in this country, this time as peace-makers. But is the USA able to hold Iraqi people in obedience and do away with the “insurgents”? It’s rather doubtful. The American soldiers possess neither restrain nor sense that the English have. The Americans get into others’ homes with their own customs and traditions. It never occurred to them that during the Crusades the Eastern Christians were ferocious enemies to the Europeans but not Saracens-Moslems. That’s why it’s extremely doubtful to await success and understanding in the Middle East in view of the Americans’ current attitude toward the Iraqis. At the best they are most likely to leave Iraq like the Englishmen did in 1932, at the worst they will repeat their Vietnamese tragedy. The newspaper “Novaya Gazeta”, which is edited in Moscow, quoted practically the same idea expressed by the Director of the Institute of Africa of the Russian Academy of Sciences Professor Alexei Vasilyev in the issue of March 18, 2004: “If the majority of Iraq’s population – Shiites - come to power, the Sunnites and the Kurds will immediately rebel against them… The Kurds want to control the territory in the north of Iraq where there are thick oil fields and they insist upon this control without reserve. But other people also live here. It means that it’s impossible to secure a tight control without armed struggle. Thus, conditions for a civil war are being created on the whole territory of Iraq nowadays. If the American coalition leaves tomorrow Iraq will plunge into fratricidal distemper”. On such a prognosis it is extremely important for the Assyrians to identify their strategy in such a way as to preserve their existence in Mesopotamia. And this serious and difficult task falls on Mr. Yonadam Kanna’s shoulders mainly. Today he is one of the most successful and progressive politicians in Iraq according to all indices. His authority as a national representative in Iraq leadership rises on an international scale and it is not inconceivable that he will become a neutral figure which suites the Shiites, the Sunnites and the Kurds as a leader. But Mr. Kanna is faced with the dilemma which is also serious and difficult. It is a choice between two positions – a statesman and the leader of the Assyrians. It is fine if he is able to represent the Assyrians as the natives of Mesopotamia in the government; the nation which is able to unite all the nations of Iraq by means of its neutrality, sense and authority and to create a prototype of Great Assyria. But if he trying to obtain a recognition as a statesman and starts forgetting his status as the Assyrian-Chaldean leader (and such “forgetfulness” has already been expressed in some of his opinions) there immediately will appear some new leaders among the Assyrians who will tear the remains of our nation in Mesopotamia to pieces as it was done by General Agha Poutros, Malik Kambar, Malik Khoshaba and Malik Yaku in their time. But in this case none can envy the fate of Mr. Kanna. Ramsen Sheeno Releases New Video,"Kholma Sodana"
Strategic Records is proud to announce, the release of “Khoolma Sodana” (The Pleasant Dream), the first video from internationally-renowned Assyrian superstar - Ramsen Sheeno. After releasing his third album, entitled Road to Love in early 2004, Sheeno agreed to a multi-video deal with Strategic Records for the production of his new music videos. 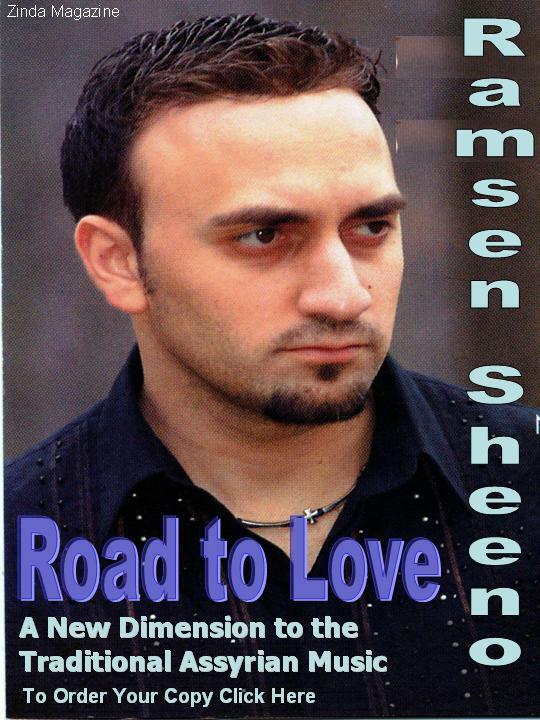 The album has received great praise from record producers, and everywhere Assyrian entertainers comment that it is Sheeno's “best work to date.” Road to Love brings a collaborated effort from many breakout producers and song writers from across the world. Sheeno's attempt to make a different CD succeeded when he sampled cutting edge vocals and music. “We are very pleased with the innovative work he put into this album and music video,” remarks Billy Haido, president of Strategic Records Inc.
Strategic Records Inc. is a division of Strategic Entertainment Inc., the production company that brought the Assyrian blockbuster film, Akh Min Khimyani. Ramsen Sheeno's new album is available in Assyrian stores globally and also at http://www.assyrianmarket.com (see Zinda Ad in this issue).